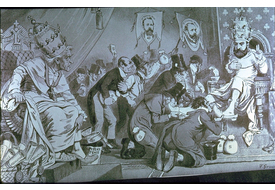 Card Text: Cartoon poking fun at muckracking ministers who, ostensibly to wage campaigns against vice, offer the public a Sabbath melodrama instead of more sober forms of worship. 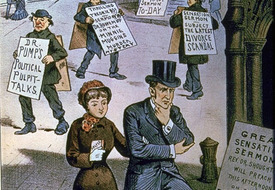 1883. 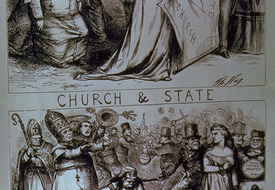 Card Text: The cartoonist sees the supposed Irish Catholic threat to the separation of church and state as dangerous to freedom in the U.S., 1870. Card Text: "Boycotting the Pope...His Holiness the Pope is in a bad way. His most faithful Irish subjects have gone back on him. They have told Leo [XIII] in very plain terms that they will take all the theology he can give them, but they decline to have it adulterated with politics. They have transferred their homage to Mr. Parnell. But it isn't the loss of allegiance that is bothering the Pope so much as it is the Peter's Pence that goes with it." Message: The pro-labor Pope is hypocritical as well as dangerous. Citation: F. Graetz cartoon. In Mary and Gordon Campbell, The Pen, Not the Sword, Nashville, TN, 1970, p. 135. Card Text: "A Business Alliance." Pope Leo XIII (at center) says, "Bless you, my children! I think we can work together nobly in America." Pictured with him are two cardinals and two strikers. In the note at the bottom Cardinal Manning states, "I have read with great assent Cardinal Gibbon's document in relation to the Knights of Labor." Anti-Catholic propaganda. Citation: Joseph Keppler cartoon. Judge Magazine. In Mary and Gordon Campbell, The Pen, Not the Sword, Nashville, Tenn., 1970, p. 139. CA Standard(s): 11.3 - The role of religion in the founding of America and its lasting moral, social, and political impacts, and issues regarding religious liberty. , 11.5 - Major political, social, economic, technological, and cultural developments of the 1920s. 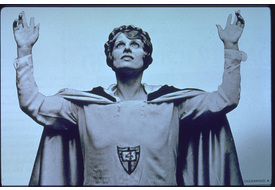 Card Text: Aimee Semple McPherson, a combination of sensualism and splendor, from her $1,500,000 Angelus Temple in Los Angeles. 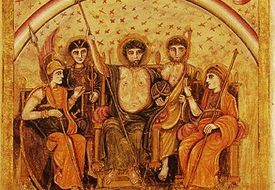 Card Text: The Meeting of the Gods, according to the Romans. From left, Minerva(? ), Mercury, Jupiter (Jove), Mars and Juno. From the Roman Vergil, one of the oldest texts of Vergil's "Aeneid," written 29-19 BCE during the collapse of the Roman Republic. Made in Rome in the 5th c. AD/CE, the Roman Virgil is one of only three surviving illustrated manuscripts of classical literature, with the Vergilius Vaticanus and the Ambrosian Iliad. This precious manuscript influenced the development of medieval art. Citation: Deorum consensus a Jove convocatus. Vergilius Romanus, The Roman Vergil. Biblioteca Apostolica Vaticana, the Vatican Library, Cortile del Belvedere, 00120 Città del Vaticano, Vatican City State, EUROPE. Cod. Vat. lat. 3867. Folio 234 verso. http://www.vatican.va/ library_archives/index.htm. Card Text: Madonna on buffalo robe, New Mexico, c. 1675. 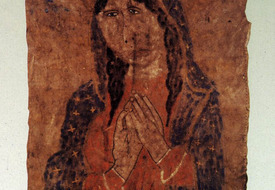 A Native artist gave Pueblo features to this rare hide painting of the Virgin Mary. Citation: Elisabeth Waldo-Dentzel Collection, MultiCultural Music and Art Foundation of Northridge (MCMAFN), PO Box 280101, Northridge, CA 91328. 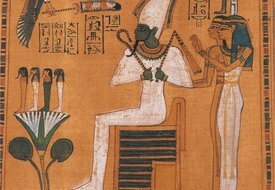 Also, Southwest Museum, Autry National Center, 4700 Western Heritage Way, Los Angeles, CA 90027-1462. 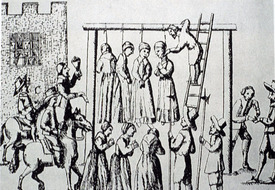 Card Text: Men hanging women "witches," 1650, England. Apparently there is no surviving image of the execution of American "witches." Engraving. Citation: Newcastle-upon-Tyne, 1649-50. Illustration in Ralph Gardiner, "England's Grievance Discovered, In Relation to the Coal Trade" (London, 1655). Peabody Essex Museum, East India Square, Salem, MA 01970-3783. Also Stapleton Collection, Bridgeman Art, Thorp Arch, Wetherby, West Yorkshire LS23 7RR UNITED KINGDOM. 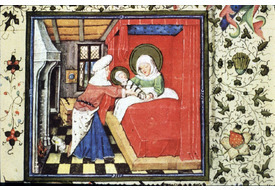 Card Text: Birth of the Blessed Virgin Mary. 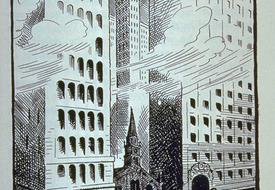 Detail of central scene. 5. From the Book of Hours of Catherine of Clèves, containing the prayers and litanies of the Mass in Latin, decorated with 157 lavishly colored and gilded illuminations by the Dutch artist, the Clèves Master, c. 1440, in Gothic style. It may be the greatest achievement of northern European illumination. North Rhineland. Citation: Morgan Library & Museum, 225 Madison Ave at 36th St, New York, NY 10016. 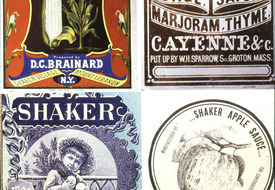 Online at www.themorgan.org.